In 1958, Belgian artist Pierre Culliford, who went by the name Peyo, illustrated a comic in the magazine Spirou that featured a diminutive supporting character with blue skin that assisted the hero Johan in his quest for a magic flute. Johan was soon overshadowed, with readers demanding more of the curious sidekick and his friends. By 1959, Culliford had a strip focused exclusively on Les Schtroumpfs, or The Smurfs. A little over two decades later, his creation became an international sensation with Hanna-Barbera’s animated series. Debuting in 1981, it ran for nine seasons. Like any children’s commodity, it wasn’t long before similar works began to spring up. In the case of The Smurfs, both Hanna-Barbera and producer Freddy Monnickendam decided that if anyone was going to emulate their success, it might as well be them. Accordingly, Snorks—essentially the story of underwater-dwelling Smurfs with breathing tubes—premiered on NBC on September 15, 1984. 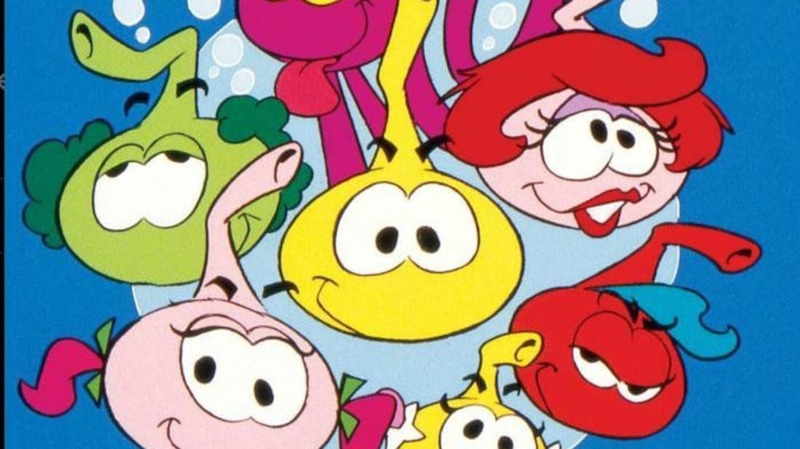 Snorks may be the best-remembered of The Smurfs knock-offs, but they were hardly the first. The fall 1981 season also brought Trollkins, a bizarre hybrid that existed somewhere between The Dukes of Hazzard and The Smurfs, about a society of tiny creatures imperiled by outside forces; an adaptation of the video game Pac-Man, airing in 1982, picked up on this narrative thread, with Pac-Land under duress. So did Monchhichis, about tree-dwelling monkeys threatened by the Glumpkins. Each of these stories revolved around pint-sized creatures who wished to live in peace, while larger, belligerent persecutors attempted to exploit or destroy their existence—a framework used to great success with Smurf village and its problems with the human villain Gargamel. By virtue of being more crassly imitative, Snorks was something different. Like The Smurfs, the characters enjoyed using their own noun to season their speech, “snorking around” their undersea kingdom or commenting on “totally snorky” incidents. While they came in different colors, their body type was generally the same: bulbous. Brought to Hanna-Barbera by Smurfs production house SEPP International, producer Freddy Monnickendam, and his collaborator Nic Broca, the Snorks had an unusually elaborate backstory. According to their lore: In 1643, a ship was overtaken by pirates and began to capsize, though the captain managed to save himself from drowning by finding an air pocket. As he struggled to stay afloat, he took notice of a tiny sea kingdom in the water that appeared filled with humanoids, but with odd features—including a snorkel protruding from their heads. When he got back to dry land, he implored people to believe his story; the Snorks, in turn, told their descendants about the giant they had once encountered. The Snorks series appears to be set in contemporary times. In the series, Snorkland occupants Allstar Seaworthy and Casey Kelp eat kelp burgers, use sand dollars for currency, ride seahorses for transport, and try to avoid the wrath of Governor Wetworth, a salty saltwater politician. Tooter Shellby, the Urkel of the ensemble, could only communicate via sound effects, which often sounded like he was operating a whoopie cushion. Critics, who usually had nothing but contempt for the Saturday morning lineup of the 1980s, didn’t expend much venom on Snorks. Writing for the Tallahassee Democrat, Ellen Klein noted that the snorkel-spouting creations did an admirable job of educating preschoolers on the benefits of cooperation. On the heels of such high praise, Snorks stuck around for a total of 65 episodes, airing on NBC and in syndication from 1984 until 1988. Despite Monnickendam’s involvement with both the Snorks and The Smurfs, the obvious crossover event never materialized. The closest Hanna-Barbera ever came was a 1984 Saturday morning preview special titled Laugh Busters, which featured a number of their established and debuting animated series. While both groups of little people were featured, they didn’t share any scenes together. Viewers did, however, get a consolation prize: Mr. T met Alvin and the Chipmunks.